The early morning air around us is translucent white with slow-falling snow, as we drive up north. This is our last day in Kelowna and we're preparing to return to our grand motorcycle trip. While the rest of Canada complains bitterly about the ceaseless snow, we are having a blast in this winter wonderland! The Okanagan has collected over two meters of base, which has made our snowboarding vacation quite successful! It's also made conditions perfect for gradually easing us back onto two wheels - because we're trying out snowbiking today! We've rented a couple of snow bikes in Vernon, about 45 minutes north of Kelowna. We follow the pick-up truck, loaded with our new steeds, further north towards Silver Star. 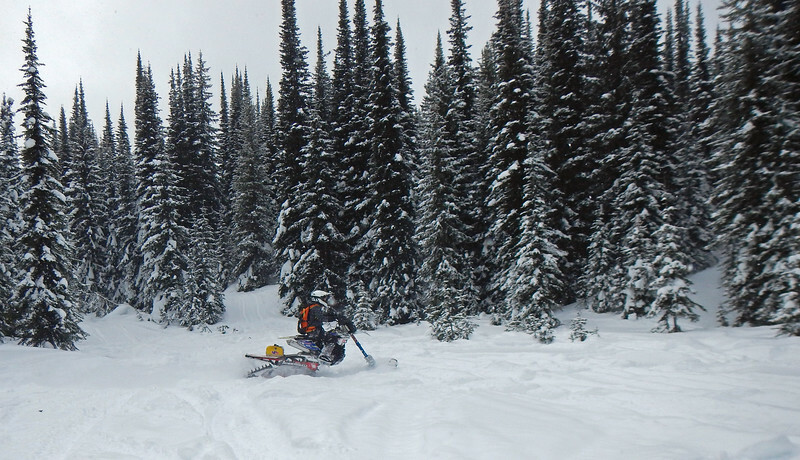 There's a snowmobiling area just outside the ski resort called Sovereign Lake, where we park and unload the snowbikes. In my mind, I'm mentally tallying the cost of owning and running these machines: long-bed pick-up truck, ramps, wheel kit for the front ski. Not to mention the cost of the snow bikes themselves! 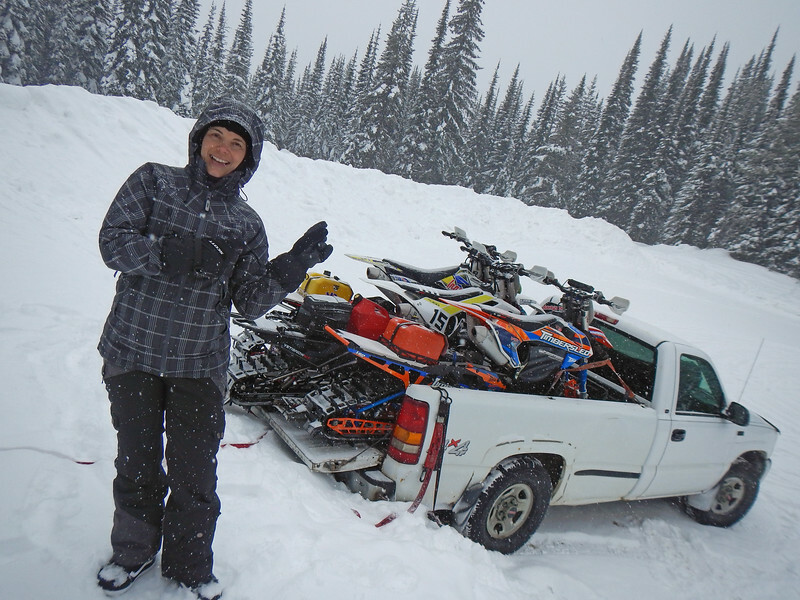 The nice thing about snowbikes over snowmobiles is that you can cram a whole bunch into the back of a truck without having to install a deck if you want to carry more than one. So... what exactly is a snowbike? 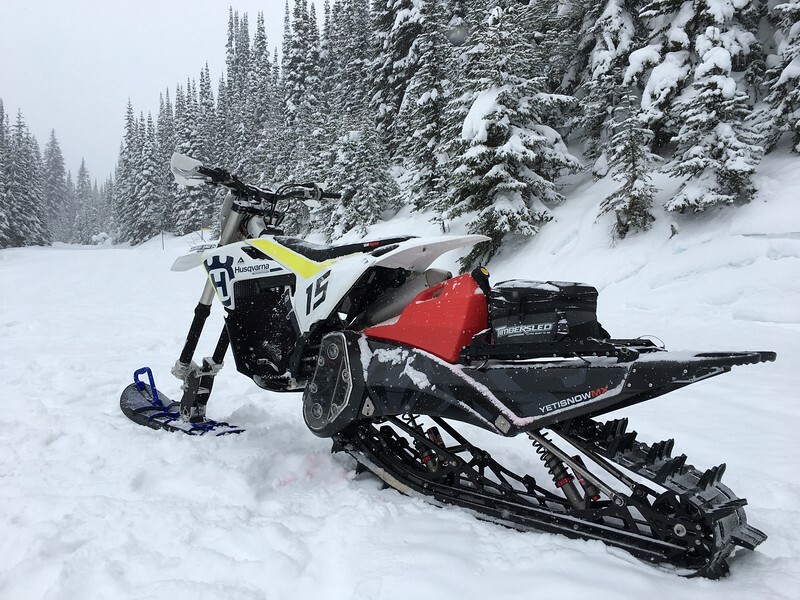 It's a dirtbike with a couple of modifications to make it similar to a snowmobile: a single ski attached to the front forks and a narrower rear track system. So basically a single track snowmobile which can lean and go places the wider snowmobile can't! Sounds right up our alley! We've brought a variety of bikes up to the trails. 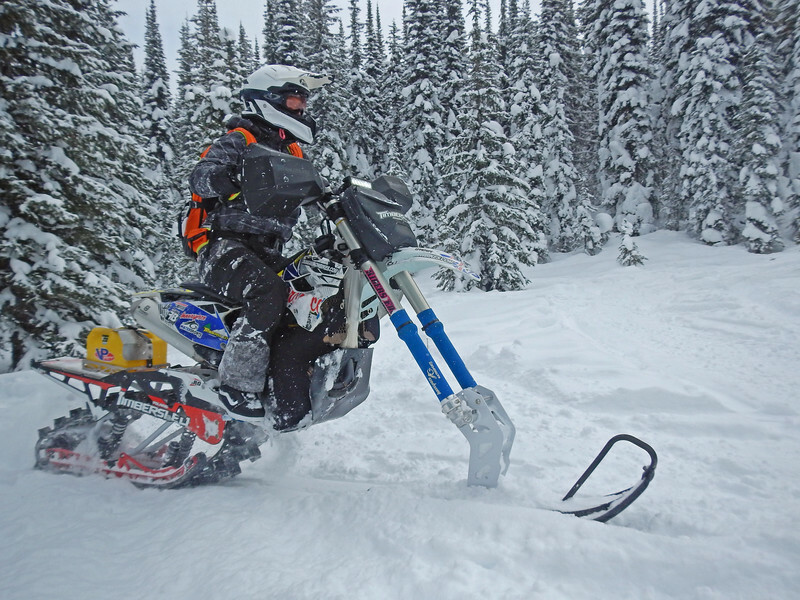 The most common snowbike is built around a four-stroke 450cc dirtbike. 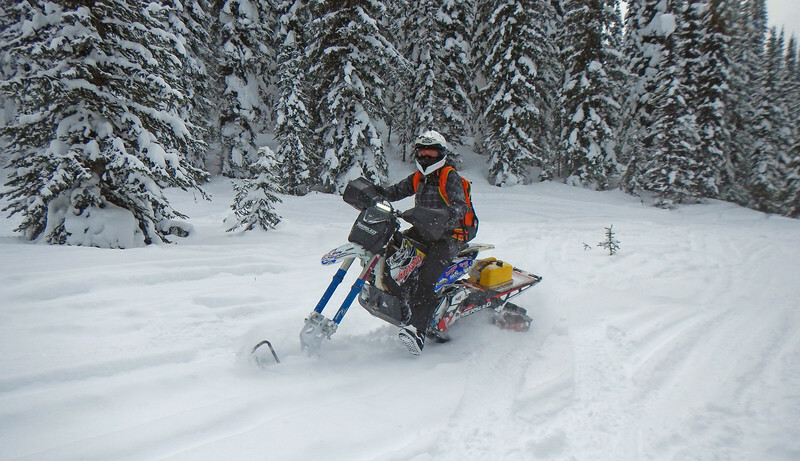 It's nice to have the linear predictability and tractability of a four-stroke plus the grunt of a 450 to power the rear track through thick powder! Today, we're testing out a KTM 450, a Husqvarna 450 and another Husky 350.
dave6253, deersSlayer, SmilinJoe and 8 others like this. There are a couple of other minor modifications to the dirtbike. The engine is shrouded with a plastic wrap to keep it warm in cold weather and to keep the snow out. 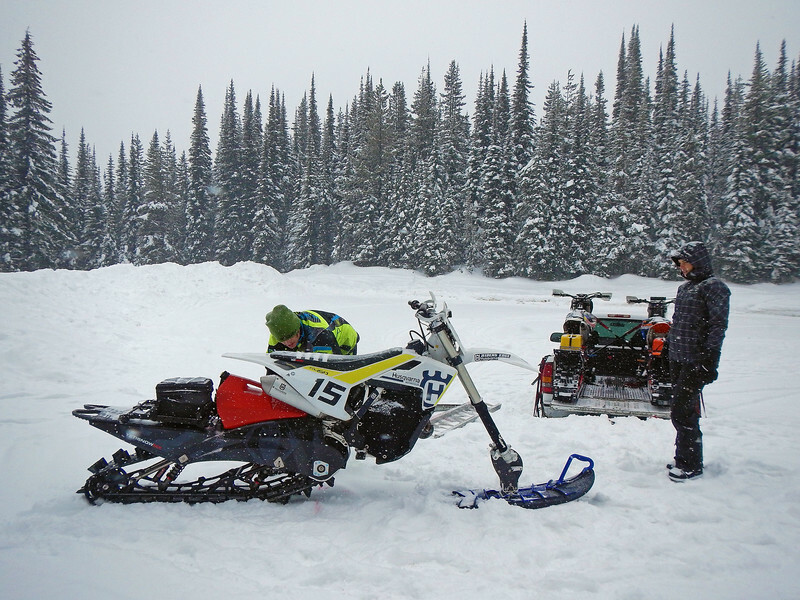 Speaking of snow, the bikes all had aftermarket ECUs installed, which re-programmed the EFI to account for the additional weight of the rear track, starting and running in cold temperatures and high altitudes. The bikes are also kitted out with smooth custom plastic skid plates, more to allow the bottom of the bike to glide over snow as opposed to just protecting the engine. We're told that the Huskies and KTM make good donor bikes because they have hydraulic clutches which make them easier to operate than the Japanese bikes with cable clutches, and since there's no rear brake, you're using the clutch 100% of the time to modulate your speed. 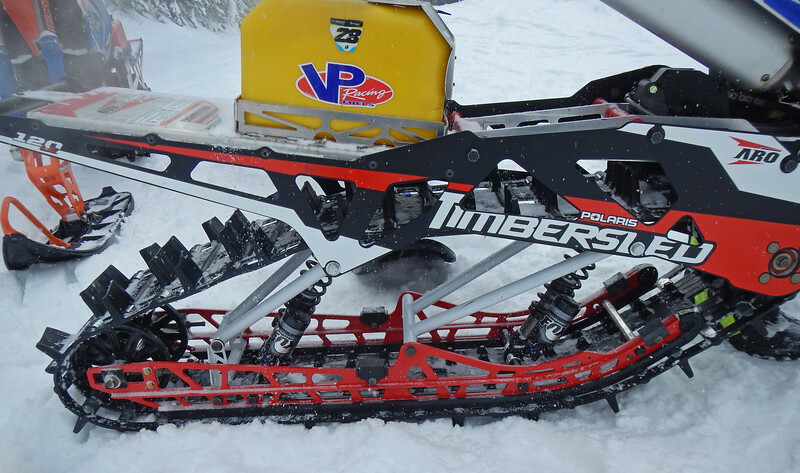 There are a few snowbike conversion kits, the two biggest names in the industry are Yeti and Timbersled. Kits start around $7K CDN. We're trying out both today. The rear track can be made of steel or a more fancy carbon fiber, and can be of different widths and lengths to vary grip and nimbleness. With a bit of practice and experience, you can switch and convert back and forth between dirtbike and snowbike in about half and hour. Another important mod: Jerry can mount on top of the rear track. It is imperative to carry extra fuel with you because you're always on the gas to power the rear track and the tiny dirtbike tanks drain quite rapidly. deersSlayer, roadcapDen, Photowriter and 10 others like this. Typically snowbikers wear the same outfits as snowmobilers, but because we've done neither, we just wear our snowboarding gear. 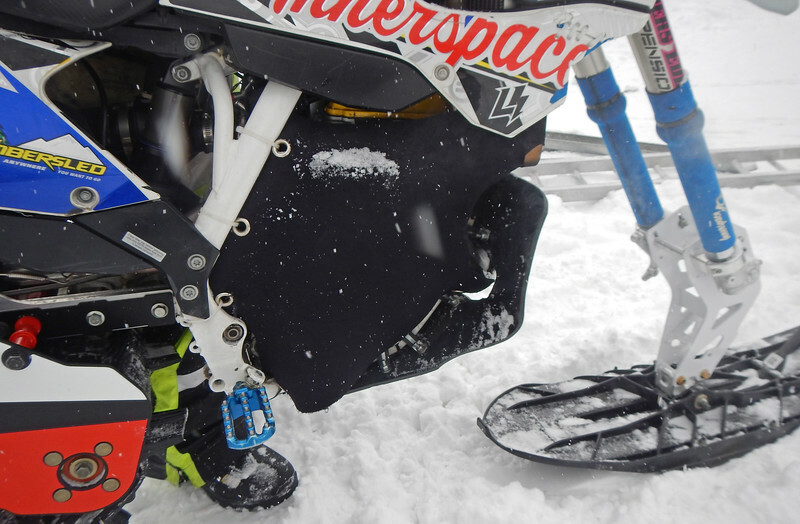 Snowboard boots are actually quite suited to snowbiking, giving both good protection and adequate flexibility. The only thing we had to rent were the dirtbike helmets. We are also outfitted with an avalanche backpack (they call them avy packs) which typically contains an airbag, a rescue beacon, radio, poles, etc. We just carry shovels because as beginners, we're just tooling around on the trails today. No chance of avalanche, although the snow keeps falling steadily as we unpack the snowbikes. Getting on the snowbikes takes a bit of a different technique... These bikes don't have a kickstand and because of the fat ski up front and the wide rear track, the bikes are able to stay upright if you plant them just right in the snow. However, since they are single track, they will tip over eventually, so to clamber on, you need to throw a lot of your body weight over the other side of the bike to balance everything out. Initially, we both had a bit of difficult mastering this technique on packed snow, tipping the bikes over quite often. And it gets worse in deeper snow because the seat could be at eye level when you're standing waist-deep in the pow! 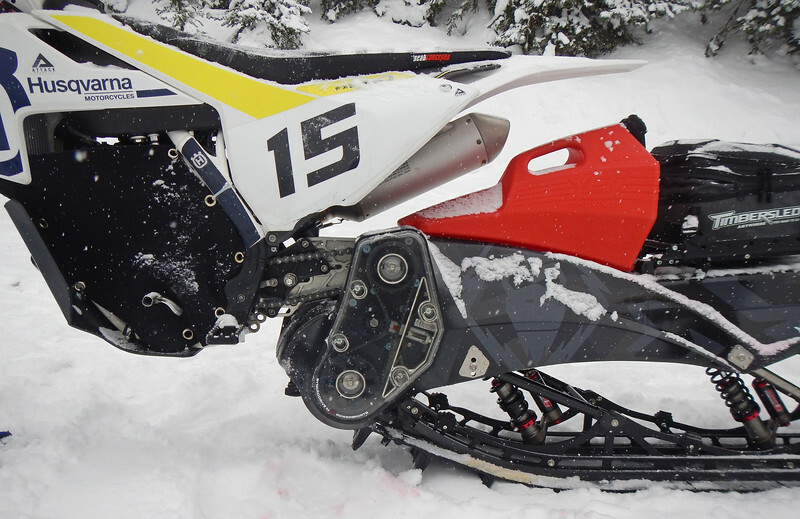 Once you've mastered getting on the damn thing, riding the snowbike is exactly like a dirtbike! 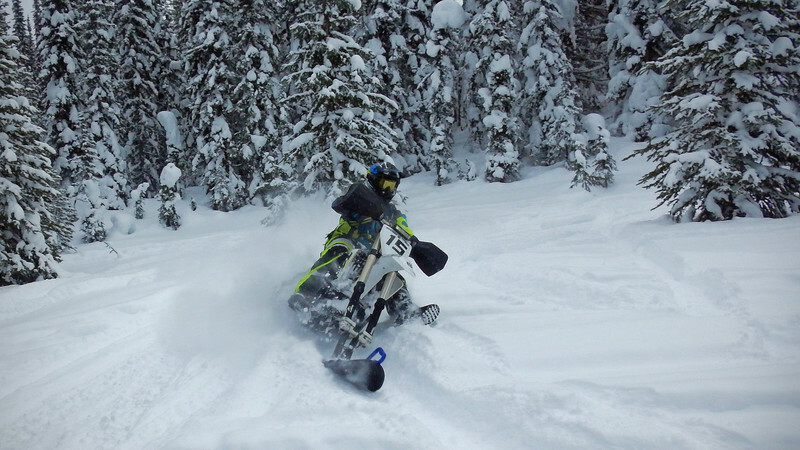 In fact, you have to exaggerate your dirtbike techniques to turn the snowbike, shifting your bodyweight to the outside of the turn to push the bike down into the corner. Counter-steering works a little bit, but it's just not as effective as getting that rear track on it's edge and sliding it around the corner with a liberal dose of gas. This rear-end throttle steering that's so intuitive to dirtbikers might be a bit more difficult to get the hang of for street riders. But it doesn't take that long before you implicitly trust the stability and grip of that rear track. There's so much more contact patch than the rear tire of a dirtbike, that it's easier to swing the rear around with the throttle. Unlike dirtbiking, you stay planted on the seat for most of the time, only getting up on the pegs when riding over bumps and whoops. Also, you sit further back on the seat as opposed to right up on the tank, dirtbike style, getting your weight over the rear track and letting the front ski do what it wants, bouncing and skipping over irregularities in the snow. Exactly like snowboarding in fresh powder! Body english and the rear track are your steering wheel. dave6253, deersSlayer, SmilinJoe and 12 others like this. Another major difference is slowing down. There is so much drag on the rear track in the snow that simply letting off the throttle will dramatically slow the bike. You only have to pull in the brake lever if you want to come to a complete stop. And that's where the other significant change to motorcycling comes in. I had to override years of motorcycle muscle memory that instinctively made me want to lean the bike at a stop and put my left foot down. If you do this, your foot will sink in the snow and you'll find yourself covered in powder and snowbike. And then good luck trying to get back on again! 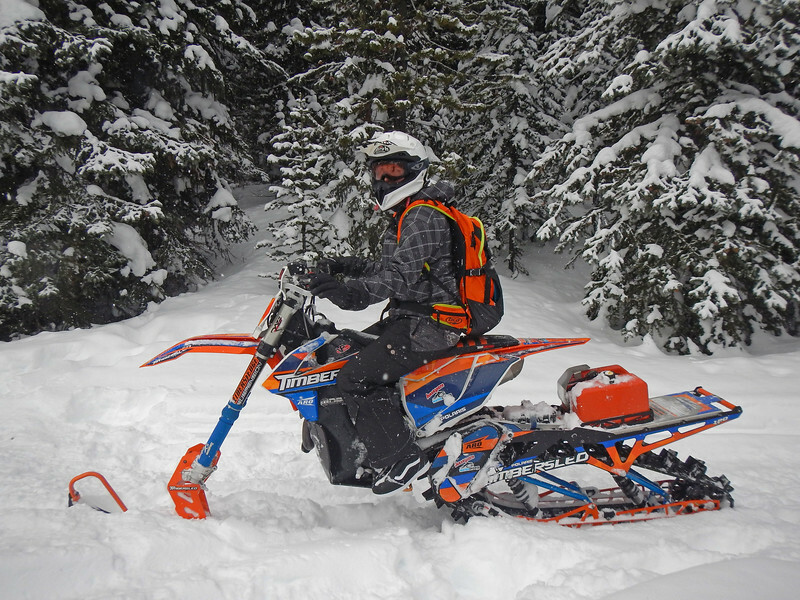 The proper technique is to find level ground and when you come to a stop, wiggle the front ski to dig a nice hole so the bike gets planted and then you just keep your feet on the pegs like a snowmobile or three-wheeler. You just have to trust the snowbike won't tip over, which goes against every motorcycle instinct. Since we were here mid-week, the trails were pretty much empty. We had the whole Sovereign Lake area to ourselves! And the snow kept on falling, so when we returned back to the same trails we were just on 10 minutes later, our tracks were completely covered. Fresh pow all day long! There is a main 15 km loop which we got familiarized with how to operate the snowbikes, but once we were comfortable, Joel took us out onto to a frozen lake where we could practice tight turns and figure eights amongst the trees. The Huskys were fitted with handlebar muffs which blocked a lot of the cold air hitting the gloves, but the KTM that I was riding had an awesome mod: they had pipes rerouting the rad fluid through the handlebars, so it acted as hand warmers! Cool! Er... warm! TwilightZone, dickosaurus, DantesDame and 24 others like this. This was so much fun!!! Although the idea of putting skis on a bicycle frame has been around for over 150 years, the modern snowbike has only come into its own since 2011. It's exciting to feel like you're on the vanguard of some new sport! We managed a few hours out on the snowbikes before fatigue set in. Our neck and arm muscles were sore from muscling the handlebars - and picking up the bikes when we tipped over in deep powder. When we watched Joel effortlessly hoon around the lake, we noticed he was using his body more than his arms to turn. Something we've got to work on the next time! But enough boring talk and pics. Here's a riding video! We've really enjoyed our time in the Okanagan Valley. We've discovered our new favorite winter sport and we're probably going to move out here when our trip is over. But our motorcycle travels aren't over just yet. We're back to being nomadic. TwilightZone, dickosaurus, Animo and 32 others like this. "Hoon" around the lake. Must be Canadian speak, eh? Looks like a blast! At first glance, I wondered what the heck that front fender was for! Then I read the description... ah, conversion kit! Looks like so much fun! Really looking forward to more travel adventures... however we are still hanging in Japan! Catch us up, we're not getting any younger! 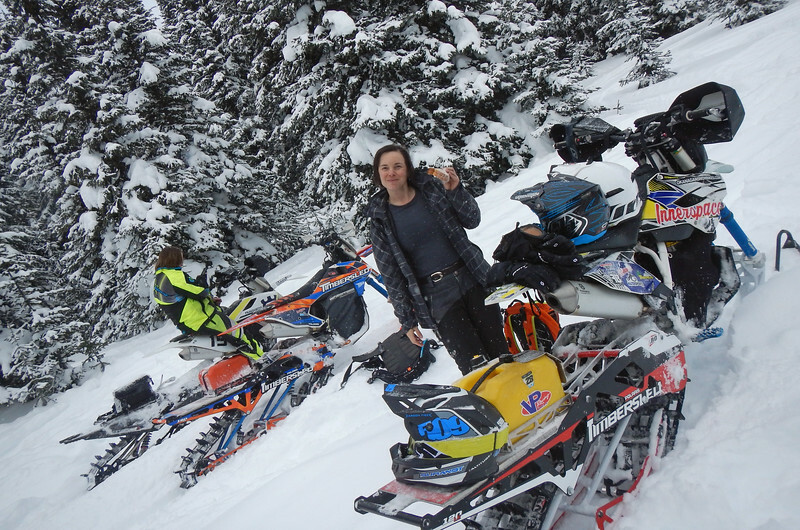 Neda and Gene: Your series of photos and report on the snowbikes is great. 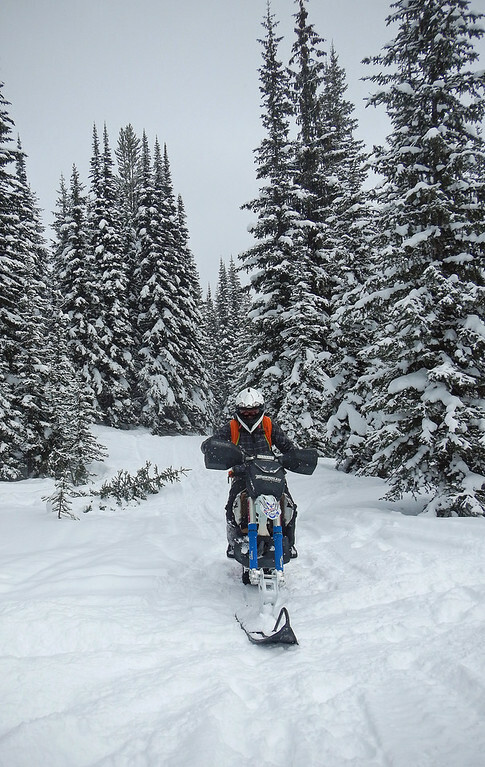 For the past few years, I have been researching the snow bike conversion kits (Timbersled Mountainhorse etc) and watching the many videos, on AdvRider and YouTube. It sure looks like a lot of fun. Could you give us your newbie impressions/comparison of the Husky and KTM & the kits. The cost of the dirt bike plus the conversion to the track/ski seems high, but maybe could have many years of enjoyment with it. Dan&Sara and you guys are my favorite Canadians! Eh? Been thinking about you guys recently. We’ve ‘talked’ over the last few years and I am finally close to heading North (from New Zealand) and heading into Western Canada, Alaska, and the Yukon, for a ‘while’. I come over here looking at the awesome ride reports up to Prudhoe Bay and Tuk, and saw your thread with some recent traffic. Can’t believe you have ended up in Kelowna! I lived out at Joe Rich (half way up to Big White) for three years, many years ago. Clearly our paths aren’t going to cross in BC this spring, but we will see what the future holds! Trust your planning for a return to travelling goes well! Catch up with you somewhere! Yep, we visited Vancouver Island by motorcycle a couple of times. Beautiful area. We're leaving BC in a couple of days, but we'll probably be back when the trip is over. Already checking out real estate listings! Prices are dropping so fast, who knows, we may even be able to afford a place out here by then! Could you give us your newbie impressions/comparison of the Husky and KTM & the kits. The cost of the dirt bike plus the conversion to the track/ski seems high, but maybe could have many years of enjoyment with it. I'm sure if I went out a few more times and got more experience, I'd start to notice the difference. And yes, the cost of the kit is high, but the winters are so long! At least this could get you out riding pretty much the whole year! MaNDan, Mofrid, DunkingBird and 1 other person like this. Can’t believe you have ended up in Kelowna! I lived out at Joe Rich (half way up to Big White) for three years, many years ago. Clearly our paths aren’t going to cross in BC this spring, but we will see what the future holds! "Counter-steering works a little bit" Really? WoW. Great stuff as always Guy's! Those snow bikes look like something from Hoth! Didn't see any young Jedi out there, did you? Or are the two of you.......?? ?